(a) Remove the rear No. 2 seat (see page 72-61 ). (b) Remove the rear seat lap type belt assy RH. (c) Install the rear seat lap type belt assy RH. (b) Remove the rear seat inner belt assy. Remove the 2 bolts and 2 belts. (c) Install the rear seat inner belt assy. (e) Remove the rear seat reclining cover LH (see page 76-21 ). 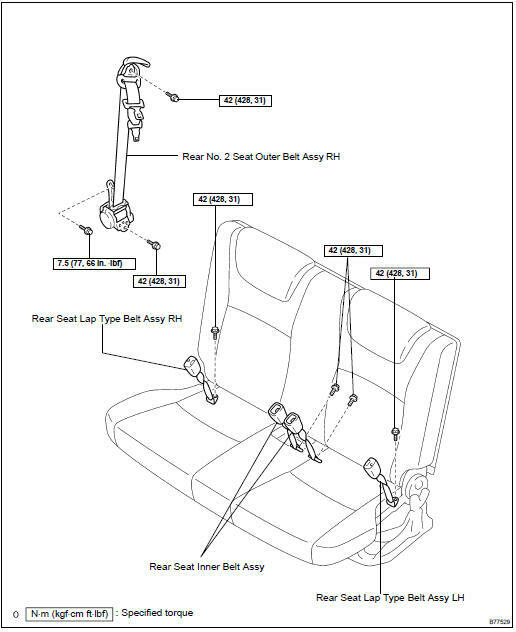 (f) Remove the rear seat reclining cover RH (see page 76-21 ). (g) Remove the deck floor box RR (see page 76-21 ). (m) Remove the rear No. 2 seat RH (see page 76-21 ). 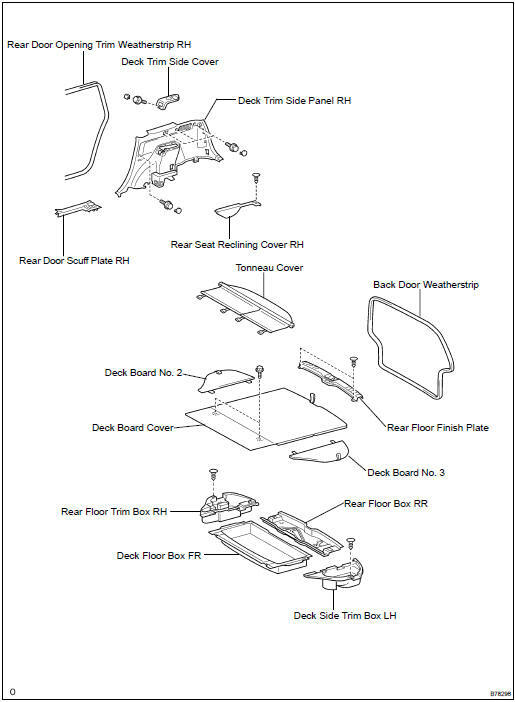 (q) Remove the rear door scuff plate RH (see page 76-21 ). (r) Remove the deck trim side panel RH (see page 76-21 ). (s) Remove the quarter pillar garnish RH (see page 76-21 ). (t) Remove the rear No. 2 seat belt assy outer RH. Using a screwdriver, open the seat belt anchor cover HINT: Tape the screwdriver tip before use. Remove the 2 bolts and belt. (u) Install the rear No. 2 seat belt assy outer RH. Check the amount of inclination required to lock the retractor. When the inclination of the retractor is 15 or less, check that the belt can be pulled from the retractor. When the inclination of the retractor is over 45 , check that the belt locks. If operation is not as specified, replace the outer belt assy. Install the belt with the 2 bolts.